The Tower of London has an iconic status in British history and it’s no surprise that this palace, fortress and one-time prison is still one of the biggest attractions in the UK’s capital. It’s been a home to royal beasts, the Crown Jewels and Henry VIII’s armour over the years. It was also the final residence of notorious figures such as Anne Boleyn and Guy Fawkes. Book one of our ticket and hotel packages to get the best out of your trip to London and to make sure you get to explore this fascinating building! Begun by William the Conqueror in the 1070s, the original Tower of London was a magnificent Norman castle on the banks of the River Thames. Though this was the seat of power for the kings and queens of England, it was more a fortress than a royal residence, without the comfort of palaces such as Westminster. Throughout years of medieval unrest and several sieges, the Tower remained intact, though it was breached during the Peasant’s Revolt of 1381. In 1483 the Tower gained two of its most famous royal prisoners, Edward and Richard, known as the Princes in the Tower. Though they are thought to have been murdered by Richard III, the truth has never been uncovered. During the following centuries, Tower Green saw the executions of many political and religious inmates, such as Sir Thomas More and it was in the 16th-century reign of Henry VIII that the Tower’s reputation as a prison was cemented. He executed two of his seven wives there. Henry’s daughters, Mary I and Elizabeth I, continued the Tudors’ bloodthirsty ways. At the end of the English Civil War, King Charles I lost the Tower to the parliamentary forces of Oliver Cromwell. Cromwell melted down the Crown Jewels to be sold on behalf of his new Commonwealth but new jewels appeared with the restoration of Charles II, only to be threatened by thieves in 1671. The Tower’s defensive use dwindled in the 1800s and institutions such as the Royal Mint, the Royal Menagerie and the Record Office left the buildings. However, its aesthetic appeal was improved in the 1850s following the trend for Gothic Revival architecture, which accounts for the overall look of the building today. By the end of the 19th century, tourism had come to the Tower as the masses began visiting it in their thousands. Though it doubled as a prison again during the two world wars, the modern Tower of London is solely a historical attraction, as well as being a UNESCO-recognised site. Among the many highlights that bring today’s crowds to the Tower of London are the popular, if unexpected, animal exhibits. The Royal Menagerie was a collection of exotic fauna given as gifts to ruling monarchs until the early 19th century. Visitors can see the exhibition in the Brick Tower as well as the only living animals left at the Tower, the ravens. These legendary birds have been kept here since Charles II became convinced that their departure would mean the kingdom would fall. One of the most appealing sights is the Crown Jewels display. Under tight security since 1671 – when a gang led by Colonel Thomas Blood attempted to conceal the state crown, orb and sceptre in their clothing – the Jewels contain an incredible 23,578 gemstones. Guided tours of the Tower are given by the famous Yeomen Warders or Royal Bodyguard, who still patrol the grounds. They were nicknamed ‘Beefeaters’ for their privileged position at the king’s table in past times. Today’s guards are long-serving members of the armed forces and they regale visitors with bloody tales of torture and strife. By booking a Tower of London break with hotels nearby you can explore at your leisure. Make sure you venture to the Prisoners at the Tower exhibition for an insite into the people who were imprisoned there, including Sir Walter Raleigh, Sir Thomas Moore, Guy Fawkes and the Bishop of Durham. And don’t forget to take a look at the remarkable Crown Jewels, including crowns, orbs, swords and robes. We have a wide range of hotels close to the Tower of London so do take a moment to find the one that suits your requirements – chose a date and book now! 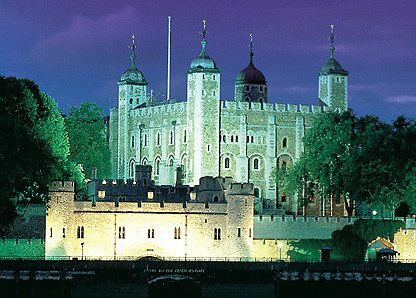 So whether you come to spot one of the legendary ravens, walk in the footsteps of a doomed prisoner (and even a ghost or two) or explore ancient armour in the White Tower, the Tower of London lets you pack centuries of history, intrigue and excitement into a your weekend break to London.